Watch this TV news segment featuring Cheryl (and other therapists and educators who presented) at the University of Wisconsin at La Crosse Mental Health and Trauma Conference for Educators. ​Listen in on select radio interviews and check out the many radio shows where I’ve been a guest speaker on topics ranging from coping with the holidays to creating a blueprint for a successful life. "You are a wonderful guest with great insight." "Your understanding and compassion come through even in a short interview. 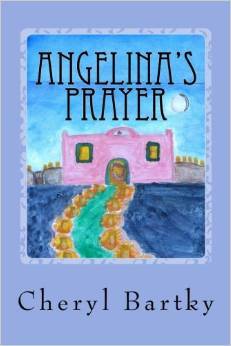 And my 9-year old daughter loved your book, Angelina's Prayer! KLAV 1230AM - The Talk Of Las Vegas (Las Vegas, NV): "Conversations With Cogee"
To invite me on your show please contact me! Thank you! Cheryl Bartky is a licensed professional clinical counselor, a board certified dance-movement therapist and life coach, and an experienced spiritual director. She’s the author of Angelina’s Prayer a story told through the eyes of a child about loss and longing and the healing power of kindness, compassion and community, available on Amazon.com. With 30 years experience, she specializes in life purpose/career counseling, making your dreams come true, the spirituality of daily life, as well as grief, loss, and trauma. You can find more about Cheryl, her work, her book, and Creating Compassionate Kids the free companion Activity Guide to Angelina’s Prayer at www.Counseling4theSoul.com. Visit and "Like" her on Facebook.com/cherylbartky. Follow her on Twitter at @cherylbartky.